Our Abpromise guarantee covers the use of ab6876 in the following tested applications. Immunohistochemistry (Formalin/PFA-fixed paraffin-embedded sections) - Goat Anti-Chicken IgY H&L (Biotin) (ab6876)This image is courtesy of an Abreview submitted by Carl Hobbs. 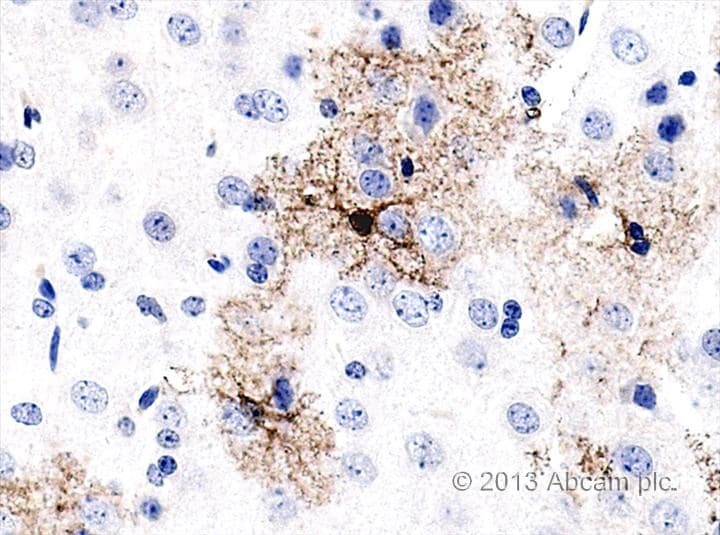 ab89999 staining GFAP in rat spinal cord tissue sections by Immunohistochemistry (IHC-P - paraformaldehyde-fixed, paraffin-embedded sections). Tissue was fixed with formaldehyde and blocked with 1% BSA for 10 minutes at 22°C; antigen retrieval was by heat mediation in citric acid. Samples were incubated with primary antibody (1/300 in TBS/BSA/Azide) for 2 hours at 22°C. A biotin-conjugated goat anti-chicken IgY H&L (ab6876) (1/100) was used as the secondary antibody. Immunohistochemistry (Frozen sections) - Goat anti-Chicken IgY H&L (Biotin) secondary antibody (ab6876)Image from Yang Z et al., J Biol Chem. 2011 Apr 1;286(13):11444-55. Epub 2011 Jan 29. Fig 3.; doi: 10.1074/jbc.M110.212480; April 1, 2011, The Journal of Biological Chemistry, 286, 11444-11455. Immunohistochemical analyis of Human lung tissue stained with a chicken primary antibody, followed by ab6876 at 1/500 dilution and horseradish peroxidase-conjugated streptavidin. Staining was detected using DAB. Publishing research using ab6876? Please let us know so that we can cite the reference in this datasheet. I would like to know were is exacli attached the biotin. Is it only in the Fc region of the antibody? I am thinking of using this antibody as a negative control for a biotinylated goat polyclonal Ab. Have you got any data regarding cross-reactions with human, rabbit and mouse proteins (especially Ig)? Thank you for your enquiry. All the information that we have regarding this antibody is located on the online datasheet. At this time, we do not have any data about cross-reactivity with human, rabbit and mouse proteins. Is this Antibody compartible (regarding sensivity) with Antirabbit IgG-Biotin from DAKO? We don't have any data on the sensitivity of antibodies from DAKO, so its' difficult to compare. We do know that this antibody recognises 1µg chicken IgG at a working dilution of at least 1/20000.